Measures based on claims would be limited to: (1) assessing whether consumers with an indicated need for treatment (that is, those with a specific diagnosis) receive any psychotherapy; and (2) counting the number of visits over a specific period of time. Claims data are low-cost/low-burden. Using claims data is a low-cost, low-burden approach to tracking the receipt of psychotherapy. Researchers have proposed such measures and demonstrated some link to improved outcomes (Rost 2005). Some measures of continuity of care have demonstrated a strong positive association with outcomes among people with serious mental illness (Adair et al. 2005). Data from health plans and the VA health system suggest that the number of visits for most individuals is not concordant with guidelines and is affected by distance to the site of care (Pfieffer 2011); availability of trained providers is also likely to be a factor. Such a measure could be useful in monitoring possible disparities in access to care. Such measures could be more readily implemented than the structure and outcome measurement approaches described here. They could be an interim step to ensure psychotherapy, an important form of behavioral health treatment, is delivered as part of broader health care system reforms as they are being implemented and then later updated as more advanced forms of performance measurement for psychotherapy are developed. Billing codes for psychotherapy lack detail on the content of visits, and they vary across health plans and states. The lack of specificity in psychotherapy claims contrasts with measures that look at the course of medication treatment (continuity of antipsychotics for people with schizophrenia, for example) where there is detailed information on the active ingredient and dosage that was filled by the consumer (although one cannot be certain that medications are actually taken). Currently used billing codes for psychotherapy have broad labels like "individual psychotherapy" or "group psychotherapy," and they provide no detail on what psychotherapeutic techniques were used or what content was delivered during the visit. Although ICD-10-PCS codes for procedures do have more detailed information (for example, 2014 ICD-10-PCS Code GZ58ZZZ, http://www.icd10data.com/ICD10PCS/Codes/G/Z/5/8/GZ58ZZZ, Individual Psychotherapy, Cognitive-Behavioral), this procedure classification is slated for use in the United States for procedures performed in hospital inpatient settings and would have limited applicability to ambulatory care (American Psychological Association 2013; CMS 2013). In addition, state Medicaid programs (and other state-based programs) have developed their own psychotherapy billing codes (some state Medicaid programs have hundreds of such codes). Some of these codes are tied to the credentials of the provider, but few give detail on the content of the psychotherapy. Such variation in the billing practices of state Medicaid programs complicates the use of claims data to measure the content of psychotherapy and make valid comparisons (Brown et al. 2012). Current practices for coding diagnoses also make it challenging to define the eligible population for specific psychotherapy. The introduction of ICD-10 diagnoses codes (planned for 2014) will provide more detailed coding that will make it possible to target eligible population and to improve coding (CMS 2013). For example, codes will allow for documentation of exacerbating features and status of remission. However, claims data are limited to services provided and covered by a specific payer. Information on care is limited to the period of enrollment, and care provided in other settings (for example, employee assistance programs, schools, or state-funded mental health clinics) may not be captured. The need for a clear link between billing codes and outcomes is a fundamental criterion for national endorsement of quality measures. There may be opportunities to develop new billing codes to capture data on the use and content of psychotherapy, but changes in payment policies are likely to be needed to encourage providers to implement and consistently bill for such services. CMS has recently introduced new billing codes for evidence-based behavioral health services, such as depression screening and Screening, Brief Intervention and Referral to Treatment for alcohol misuse, but at this time it is unclear how widely these new codes are used and what changes in Medicare payment policy will be necessary to encourage their widespread use. Promoting visits, not quality. Measures that promote visits while ignoring the content of psychotherapy and outcomes have the potential to encourage service utilization without proof of its benefits. To date, there is little evidence that mental health services are being overused (Druss 2007); however, it may be difficult to measure adequately from claims. Examples of issues that are likely to arise during measure-development include what type of contact between a provider and consumer is necessary to constitute evidence-based care (that is, in person or by phone, or with a primary care provider or behavioral health specialist) and what duration of treatment or number of visits is necessary. The frequency and duration of treatment would be informed by psychotherapy trials, but there are many patient-level characteristics that can affect the treatment course but that are not captured in claims data, such as illness severity and experience with past treatment. Finally, there is little evidence that shorter episodes of psychotherapy are necessarily associated with worse outcomes. Some research has even suggested that consumers who drop out after a single psychotherapy visit may have the most favorable outcomes (as measured by self-reported clinical improvements) and are highly satisfied with care, but further research is necessary to understand these patterns (Simon et al. 2012b; Baldwin et al. 2009; Stiles et al. 2003). Claims-based measures assessing the duration or number of psychotherapy visits may be most useful in the context of matched clinical outcomes data. 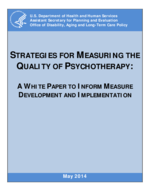 Measures that assess the delivery and continuity of psychotherapy based on claims data may be reasonable as interim measures that provide a crude picture of service utilization. It is important, however, to consider the potentially negative consequences of encouraging care with unknown benefits. Measures based on claims could be more useful if billing codes were improved and if billing were tied to credentials or certification; that is, if the billing code indicated that trained professionals were providing specific psychotherapeutic content.